NPR aired a five minute segment by correspondent Nick Miroff on the state of the Cuban Internet. 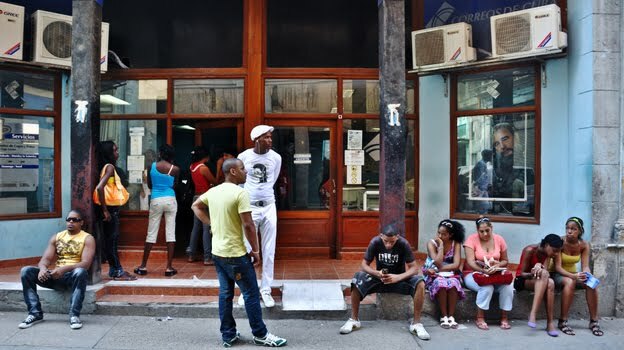 Miroff portrays Internet access as expensive and limited, as illustrated by this photo of Cubans waiting to get online at a Havana cybercafe. He also points out the irony of Cubans carrying smart phones that can only be used for texting and voice calls and a Cuban TV presentation on Facebook and Twitter, which are unavailable to all but a tiny portion of the population. Miroff also mentions Cuban's disappointment that the ALBA cable has had no discernible effect, citing swirling rumors of technical problems, bad business deals, or political fear flamed by the role of social media in the Arab Spring -- the dictator's dilemma again. You can listen to the segment or read a transcript on the NRP Web site.